In 2003, after graduating from UNC-Chapel Hill and spending almost two years in Wyoming, I came back home to Charlotte to try to figure out what I wanted to be when I grew up – realizing that I was grown up. 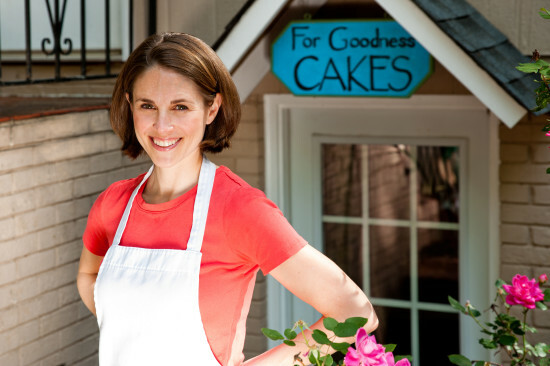 Baking and art had always been my two favorite hobbies, so I got a part time job assisting Kathy Allen, whose wedding cake business is one of the most highly regarded anywhere around. I learned a lot working for Kathy, including that pastry arts might be the career for me. With each and every cake, from simple homestyle cakes to elegant multi-tiered wedding cakes, I continue to learn and perfect my craft. I love using my hands in many ways, from scraping cake batter in a bowl to meticulously forming delicate gumpaste flower petals. Meeting new people and working closely with them to customize cake designs gives me energy and excitement. I am grateful for a career that allows me to work out of my home while raising two young children, and that gives my passion for creativity an outlet every day. What I do is still a joy as well as a job, and it’s a privilege to create delectable centerpieces for life’s happiest and most important celebrations. For Goodness Cakes is best known for a personal approach, providing customers with the attention and flexibility that makes ordering your cake a fun and easy experience. With a background in painting and art, Haines has always loved creating and designing, especially the most detailed of projects. After receiving the Best Artistry Award at Johnson and Wales University, Haines went on to master the art of making gumpaste flowers and figurines of all kinds. She loves the challenge of sculpting cakes into unique shapes and turning non-edible things into edible replicas. 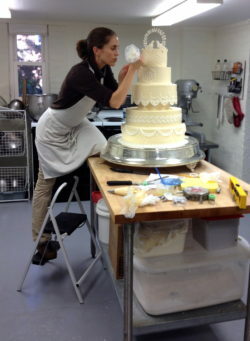 Her most practiced skill is intricate handpiping to create completely customized cake designs inspired by items such as lace, interesting textures and graphic patterns. Most importantly, your cake from For Goodness Cakes will be just as amazing to taste as it will be to see. The goodness is inside as well as out!